Hey guys. 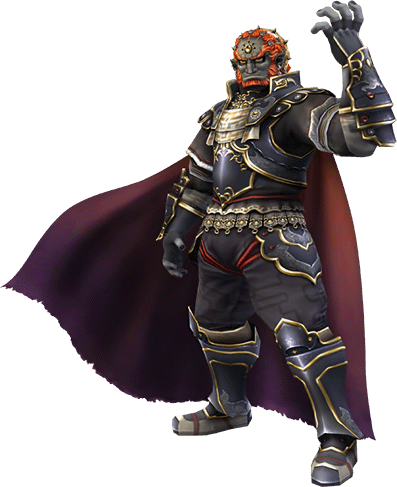 As the result of last week's poll, I made this post about Ganon, who appears in many Zelda games. He leads a long and strange life. Let's start way at the beginning. Ganondorf was born to the Gerudo tribe, a tribe of women thieves who only have a man every century. Ganondorf's father was unknown, but Ganondorf does have the last name of Dragmire. Ganondorf's childhood is unknown, but it is assumed he grew up with the Gerudo's in Gerudo Valley/Desert. 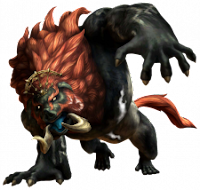 Later on in his life, Ganondorf used a sort of Dark magic to have the ability to transform into his Ganon form (which resembles a large boar). Ganondorf then claimed allegiance to the King of Hyrule, and entered the Temple of Time and the Sacred Realm (with the help of Link, who opened the Door of Time with the Sacred Stones), and stole the Triforce of Power. Through seven years, Ganondorf wreaked havoc across Hyrule, until Link defeated him with a blow to his head. Ganondorf survived that blow, but was banished to the Evil Realm by the Six Sages. Years later, Ganondorf escaped the Evil Realm and successfully took over Hyrule, but the Gods flooded Hyrule in an attempt to stop him. This refers to the Wind Waker game. Of course, Ganondorf was stopped again by Link. In Twilight Princess, Ganondorf is executed by Link in an epic battle. As we know, different Links are in different Zelda games because of the time differences, and occasionally Ganondorf would appear and be defeated in them. But he is finally defeated in Twilight Princess, and it is unknown if he will appear again.